"AM I NOT A MAN AND A BROTHER". Central design motif illustrates a male slave manacled and in chains, kneeling r. on ground, in supplication. Legend on reverse reads: "*MAY SLAVERY OPPRESSION CEASE THROUGHOUT THE WORLD". Central motif of clasped hands. Chain−decorated edge. 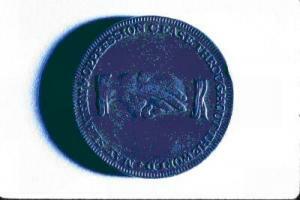 This late 18th century British anti−slavery token propagandized the abolitionist sentiment throughout the British Empire and contributed to the ultimate outlawing of slavery in British held lands in 1833. 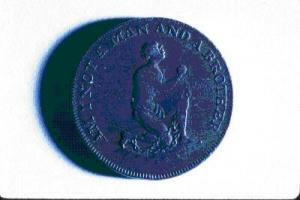 Tokens of this pattern circulated in America and, with similar tokens of American origin, popularized and propagandized the abolitionist cause.